The Fishermen’s Club, Royal Parade, Eastbourne BN22 7AA. Sicily Italian Restaurant, 2a Elizabeth Street, London, Belgravia SW1W 9RB. Ticket price: Free to diners. Swansea Jazzland, The Garage @Whitez, 47 Uplands Crescent, Swansea SA2 0NP. Andy Panayi with Mark Nightingale, Simon Woolf + drummer tbc. The Spice of Life, 6 Moor St, Soho, London W1D 5NA. The Verdict Jazz Club, 159 Edward Street, Brighton BN2 0JB. Splash Point Jazz Club at the Master Mariner, Inner Lagoon, Brighton Marina Village, BN2 5WD. Ronnie Scott’s Jazz Club, 47 Frith Street, Soho, London W1D 4HT. Ticket price: £42.50/£32.50 & £25 (restricted view seating). 20% off for Ronnie Scott’s members. The Queen’s Hall, 85-89 Clerk St, Edinburgh EH8 9JG. Riverside Arts Centre, 59 Thames St. Sunbury TW16 5QF. Ticket Price: £10 + Booking Fee. Click on this link from Feb for tickets. Paris House, 21 Western Road, Hove BN3 1AF. The Depot, Pinwell Road, Lewes BN7 2JS. The Croydon Clocktower, 9 Katharine Street, Croydon CR9 1ET. Second Cup, Birmingham, 64 New Street, B2 4DU. Watermill Jazz Club – Betchworth Park Golf Club, Reigate Road, Dorking RH4 1NZ. Ticket Price: £25 non-members, £20 members and MU members, £24 oaps & £10 students. The Oval Tavern, 131 Oval Rd, Croydon CR0 6BR. The Bull’s Head, Barnes, 373 Lonsdale Rd, London SW13 9PY. Ticket price: £11 advanced or £13 on the door – Ticket link. The Hare and Hounds Pub, 79-81 Portland Rd, Worthing BN11 1QG. Bexley Jazz Club, The Kings Head, 65 Bexley High St. Bexley Village DA5 1AA. Robertsbridge Jazz Club – Robertsbridge Village Hall, 11-23 Station Rd, Robertsbridge TN32 5DA. The Bell, Clare, Suffolk CO10 8NN. Ticket Price: £10. Reserve seating on 01787 237653 or email info@jazz-nights.com. The Turk’s Head, 28 Winchester Road, Twickenham TW1 1LF. Ticket price: £15 – contact Alan Barnes for tickets. Jazz at the Village – Felpham Memorial Village Hall, 17-19 Vicarage Lane, Bognor Regis, West Sussex PO22 7DZ. To book call 01243 584932 or e-mail: info@jazzatthevillage.org.uk Bring your own drinks and nibbles. Andy Panayi performing in Cleo Laine’s Christmas Shows with special guests. The Stables, Stockwell Lane, Wavendon, Milton Keynes, MK17 8LU . Lighthouse – The Sherling Studio Poole’s Centre For The Arts, 21 Kingland Road, Poole, Dorset BH15 1UG. The Dolphin, 14 South St, Eastbourne BN21 4XF. Stapleford Granary, Bury Road, Stapleford, Cambridge CB22 5BP. Ticket Price: £20/£15 for under 16’s. NOTE: Invited audience only – if tickets become available, I will update this info. Ticket Price: None available at present. Ticket prices: £10 with golf club member price at £5. Betchworth Park Golf Club, Reigate Road, Dorking RH4 1NZ. Twelve bands performing in three venues. Venues are The Fishermens Club on Royal Parade, Leaf Hall on Seaside and Christ Church on Seaside. Ticket Price: Stroller ticket £50 – allows you to all the gigs at all the venues. Half price for children. Scarborough Jazz Festival, Scarborough Spa, South Bay, Scarborough, North Yorkshire YO11 2HD. The Snowdrop Inn, 119 South St, Lewes BN7 2BU. Ticket price: General Admission: £45 (+ £3.20 booking fee, additional transaction fees may apply). General Admission to the event. 1 ticket required per person. Children under 3 years of age do not require a ticket. Children under 18 are not permitted unless accompanied by an adult aged 18 and above. See Tickets have a dedicated phone number for Proms in the Park – 0844 209 7353(calls cost 7p per minute plus network extras). Calls made before booking opens will not be answered but may still be charged. Ticketmaster – By Phone – Tickets can be purchased by calling – 0333 321 9999. Opening hours: Monday to Friday 9am-8pm, Saturday & Sunday 10am-4pm. Calls to 0333 numbers are chargeable at a local rate from both UK landlines and mobile phones. StoryVille Jazz Club @ MK11, Keller Close (off Tilers Rd), Kiln Farm, Milton Keynes MK11 3LH. Ticket Price: Free entry – donations welcome. The Eagle Tavern, 124 High Street, Rochester, Kent, ME1 1JT . Royal Clifton Hotel, Promenade, Southport PR8 1RB. Medina Theatre, Fairlee Road, Newport, Isle Of Wight, PO30 2DX. The Woodman, 414 Archway Road, Highgate N6 5UA. The Royal Festival Hall, Southbank Centre, Belvedere Road, London SE1 8XX. Darlington Hippodrome, Parkgate, Darlington DL1 1RR. The Gardeners Retreat, Boothen Green, Stoke-on-Trent ST4 4BJ. The Circle Arts Centre, 55 North Street, Portslade, West Sussex BN41 1DH. Eastside Jazz Club, Royal Birmingham Conservatoire, 200 Jennens Rd, Birmingham B4 7XR. 159 Edward Street, Brighton BN2 0JB. The Club House, Leamington Rugby Club, Kenilworth Road, Leamington Spa, Warwickshire CV32 6RG. Saffron Hall, Audley End Road, Saffron Walden, Essex CB11 4UH. At Ilminster Arts Centre, Meeting House Arts Centre, East Street, Ilminster TA19 0AN. Ticket Price: £25 (£40 including pre-show Christmas supper) can be booked on 01460 54973. The Pizza Express Jazz Club (Soho), 10 Dean Street, London W1D 3RW. The Arts Centre, Burscough Wharf, Liverpool Road North, Burscough, Lancashire L40 5RZ. The Forum Theatre, 28 Duke St, Barrow-in-Furness LA14 1HH. The Flute and Tankard, 4 Windsor Pl, Cardiff CF10 3BX. Ticket price: £10/ £8 concessions. Theatr Clwyd, Mold, Flintshire, CH7 1YA. Ticket price: £12.00; Concessions £10.00, Under 19s £5.00. The Portsmouth Jazz Society, Executive Suite, The Inn Lodge, Burrfields Road, Portsmouth, PO3 5HH. Ticket price: £15 / £13 concessions. Unitarian Church, Emmanuel Road, CB1 1JW. Ticket price: Standard – £16.50 Student – £13.20 Under 18’s – £8.80 This includes a 10% booking fee. Guildford Jazz Club, The Pavilion, Guildford Rugby Club, Guildford Road, Godalming, Surrey GU7 3DH. Ticket price: £14 in advance (students £7) by contacting us to reserve tickets for payment on the door or online here. Unreserved tickets £16 on the door. Jazz at the Village – Felpham Memorial Village Hall, 17-19 Vicarage Ln, Bognor Regis, West Sussex, PO22 7DZ. Ticket Price: £16 (£30 including pre-show supper at 7pm) can be booked on 01460 54973. At the Blue Vanguard – Exeter’s Premier Jazz Club, Gipsy Hill Hotel, Gipsy Hill Ln, Exeter, Devon EX1 3RN. Ticket Price: £10, £8 student concessions. Googlies Jazz Supper Club at Botany Bay Cricket Club, East Lodge Lane, Enfield EN2 8AS. Ticket prices: £7 members £10 non members. The Ipswich Jazz Club, The California Club, 195 Foxhall Road, Ipswich IP3 8LB. The Mayflower Theatre, Commercial Road, Southampton, Hampshire SO15 1GE. JAZZ HASTINGS @ East Hastings Sea Angling Association at The Stade, Hastings, East Sussex TN34 3FJ. Fleece Jazz Club, Stoke by Nayland Hotel, Keepers Lane, Leavenheath, Colchester, Essex CO6 4PZ. Love Supreme Jazz Festival, The Bandstand, Glynde Place, The St, Glynde, Lewes BN8 6SX. Andy Panayi with the BBC Big Band – Andy playing the lead alto chair. 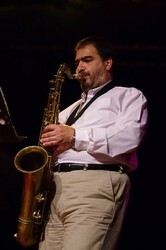 Andy Panayi with the BBC Big Band – Andy playing the tenor sax chair. The Stables Theatre, Stockwell Lane, Wavendon, Milton Keynes MK17 8LU. The Red Lion UAB, Warstone Lane, Jewellery Quarter B18 6NG. The Red Lion, 92-94 Linkfield Road, Isleworth TW7 6QJ. Andy Panayi performing with Elaine Paige – Note: Cancelled due to illness. Derby Theatre, 15 Theatre Walk, St Peter’s Quarter, Derby, DE1 2NF. Tom Paine’s Chapel, Westgate, 92a High Street, Lewes BN7 1XH.